Mina Grime is unlucky, unpopular and uncoordinated; until she saves her crush's life on a field trip, changing her High School status from loser to hero overnight. But with her new found fame brings misfortune in the form of an old family curse come to light. 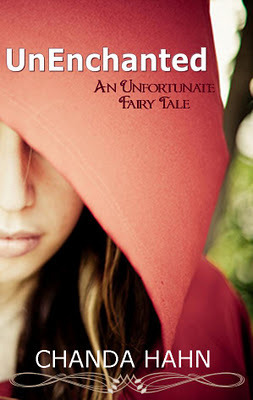 For Mina is descended from the Brothers Grimm and has inherited all of their unfinished fairy tale business. Which includes trying to outwit a powerful Story from making her it's next fairytale victim. "It's just a boring bakery tour. What could possibly go wrong, other than death from boredom?" Mina Grime is a bad luck magnet. She's not klutzy or clumsy, she literally seems to attract all the bad luck in the universe to her. So, cue the feelings of impending doom when she utters the above sentence. "You know I don't believe in fairy tales." As soon as the words left Mina's mouth, a crash of thunder shook the cafeteria, and the lights flickered on and off. So, Mina's a pretty average girl, and I liked her for that. She doesn't like to be the center of attention (which I can totally relate to). She's a little on the meek side, but can stand up for herself beautifully if the need arises and is actually rather smart/quick. "You can't tell me about this curse and then NOT expect me to help. I'm your friend. I care about you, and I care about Charlie [Mina's little brother]. It's a done deal." Nan. Her of the 'two semesters of karate, a serious case of attitude and mace on her keychain.' The best friend. Nan and Mina are total opposites, but they would do anything for each other. Of course, they tend to snark at each other, even while being best friends - both of which makes me adore them even more. "Not every tale has a happy ending. In fact, many of them are grim." "It is why the stories keep changing throughout history, as each Grimm's action or decision changes the outcome." Very cool! I think it could have been implemented a little better - not as haphazard - but I love the idea behind it. Forcing some poor sap to live through the various fairy tales? Yes, please! All is not good in fairy tale land, though. This book has one thing that I hate. So, Mina saves his life. (Totally not a spoiler considering it says so in the synopsis. And in the first sentence of the book.) At great personal risk to herself, I might add. However, he never even once thanks her. Can't be bothered to be grateful she saved his worthless life, I guess. The school, in an effort to get some funding, allows a news crew to interview Mina on the school grounds. All the other students are there - in the auditorium, I believe - and while they are cheering for her, Brody is sitting there, frowning at her and unmoving. Grateful slug, isn't he? Later on, she must go to his house and rides her old bicycle there. Which he then accidentally runs over with his car. She, unable to face him, run off. Instead of waiting for tomorrow, as they go to the same school, he later admits that he tried calling her to apologize. (Nice, right? Just wait.) Her number's unlisted. He checked with his friends. None have her number. He tried finding her address. That's unlisted to. He then tasks one of his employees with finding where she lives. This employee couldn't find the exact address, but discovered that she lives in the 'international district.' He then proceeds to drive around that district the next morning until he finds her. Restraining order, I'd like to introduce you to Brody Carmichael. You will grow to know him well. It wasn't until Mina saw that he was going forty over the speed limit that she thought to panic. "Brody, slow down!" she yelled. He pounded the steering wheel in frustration, his blue eyes stormy with anger. "Stop! If you're going to drive like a crazy person, you'll have to let me out!" When Brody didn't seem to hear her, she began to panic, grabbing the door for safety. He eventually calms down, but proceeds to demand an explanation from Mina, basically blaming her for being attacked and then almost orders her to do something she really doesn't want to. However, Mina, once again, shows at least some brains. "Hanging out with me for two days does not give you permission to decide what I should do and should not do."